After a day mostly dedicated to tasks around the office I jumped at the opportunity to meet Emma at Wright-Locke Farm to get an up close view of their composting set up. 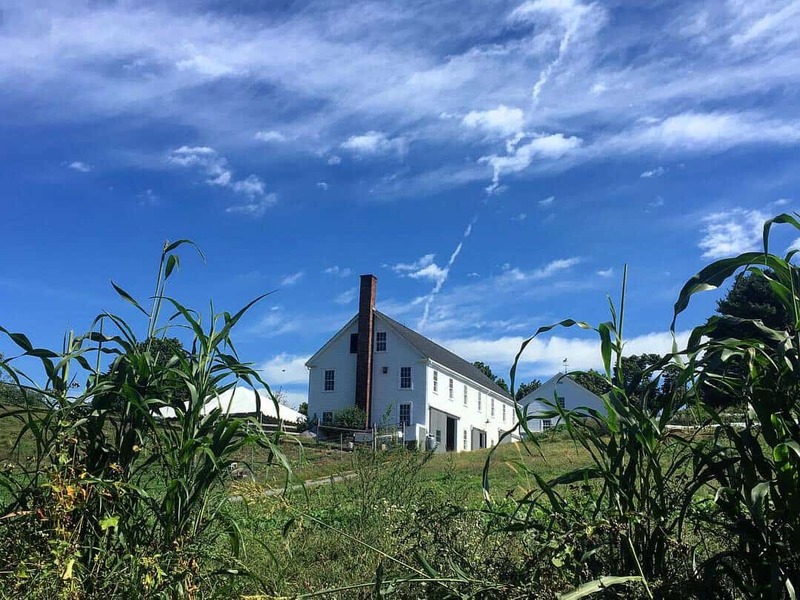 Wright-Locke, for those who do not know, is an authentic historical farm situated in Winchester. Known locally for many years as the “Raspberry Farm” for their acres of PYO berries, Wright-Locke has transitioned away from monoculture and into the world of sustainable agriculture. Not only are they able to boast organic production, but they also have a thriving education program and for the benefit of our purposes welcome food scrap donations for their large three-bay composting station. 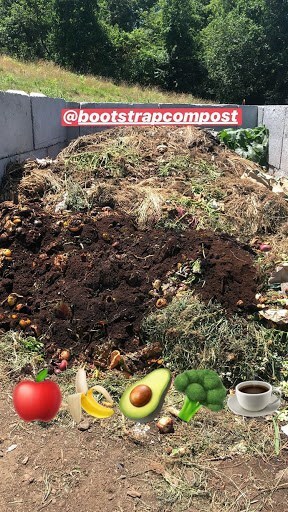 For modern organic farms, compost provides a wealth of benefits, from enriching the soil with nutrients, to building soil organic matter that fights erosion and drought, to beneficially inoculating the soil with microorganisms that reduce the pest burden on plants. Their goats, chickens and sheep also all contribute in their own way to the soil on the farm. Growing up in the area, I was familiar with WL for their nice produce and delicious eggs. Recently I got a chance to tour their facility as part of a directed study. I was able to see the inside of their barns, one of which was a technological wonder in its day. The “squash barn” was designed to house massive hubbard squashes over the long New England winter, satisfying the palettes of Boston elites with a steady supply of the sweet orange flesh. Nowadays they have a different but equally genius piece of farm technology: a three-bay composter. In this type of system, compost exists in three stages side by side. The first bay receives new material such as food scraps and plant waste. Once that fills up, it becomes a sitting pile and the next bay gets filled with new material. The material from the first bay can then be allowed to decompose and turn into compost, with the aid of regular turning, aeration and watering. After the amount of time needed to generate good compost, the original pile can be used on the farm, the second pile can be allowed to sit and the third bay can receive new material. If timed correctly, the system allows for a perfect synchrony of new and old. 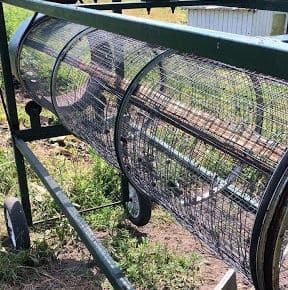 The farm also has a large trommel screen, a perforated cylinder that separates the finer particles in the compost from larger pieces. This yields a uniform product that is much more pleasant to work with. 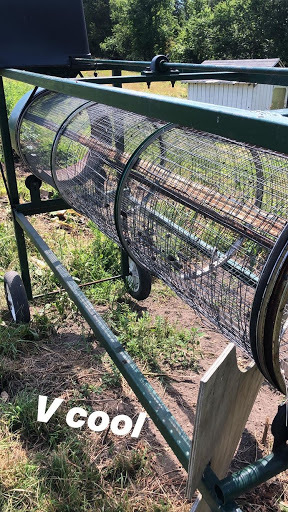 At my local community garden we utilize this system, and it works well for us since we have many hands to make light work of turning the pile. I did not get to see what they use at Wright-Locke to turn the pile but I would assume they have some heavy duty equipment. Bigger piles require more frequent turning, as microclimates can develop within the structure. Bigger piles do have the advantage of getting to and keeping higher temperatures though. At the right temperature weeds, disease, and weed seeds are killed. For an organic farm, having properly cured compost is a must, as plant disease and weed pressure can become serious problems without the help of traditional chemical pesticides. This will certainly not be my last visit to Wright-Locke Farm as I continue to learn more about their beneficial work.